I’ve come a long way since my first foray into making raw sauerkraut at home. I started out with a great deal of trepidation, reluctance, and even a bit of nose-wrinkled condescension towards the lowly cabbage. 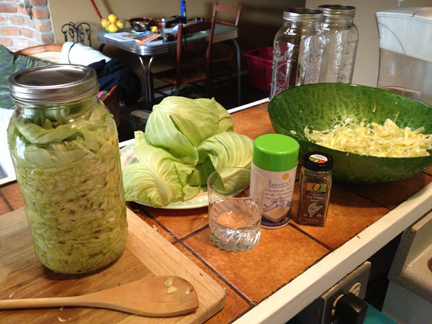 Yes, I was making kraut, but it wasn’t because I enjoyed eating it or felt that I benefited from consuming it. Nope. I was just making it because Kimberly (nutritionist and overall goddess) said I should, and I am nothing if not obedient. 1.5 *gallons* of kraut at the ready… but sorry, there’s not enough to share! I pictured myself hollering “ALL THIS SAUERKRAUT IS FOR ME, OFFICER, I SWEAR IT!! THERE’S NO WAY I WOULD TRY TO SELL IT!” as I was being dragged off to Border Violations Prison, and then I had the horrific vision of being forced to throw away all of my raw sauerkraut in front of a guard’s watchful eyes before being permitted to dock in Port Angeles, WA. What a waste of good bacteria! It was too much to bear. Yes, I am a Crazy Sauerkraut Lady, but I’m not an International, Border-Regulations-Flouting Crazy Sauerkraut Lady. Hence, I packed a solitary, small-ish jar of kraut in our cooler and braced myself for around 2 weeks without the good stuff. Almost all of our lunches and dinners now are topped with a generous portion of kraut. This wasn’t the case AT ALL on our road trip. After painstakingly rationing out that one jar of kraut and making it last as looooong as possible, we were faced with the great, kraut-less unknown. I’m not going to lie: both Marty and I suffered without regular doses of raw kraut en route to Arizona. Our bodies had become accustomed to healthy portions of probiotics on a daily basis, and the combination of being on the road + camping + eating for convenience (oh, hello gluten!) + sauerkraut withdrawal proved to be pretty deadly. Let’s just say that I nearly wept at the altar of Whole Foods when we finally rolled into Tucson and purchased several “transition” jars of raw kraut to tie us over until I could make our own again. Heh. Even though this receipe is for red cabbage/beet kraut, most of the photos in this post will be of green cabbage. Just use your imagination and pretend that everything is a healthy shade of purple. Remove outside leaves of the cabbage (approx. 5-6 leaves) and set aside for later. 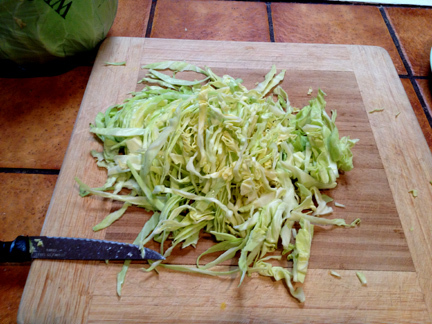 Chop rest of cabbage into thin ribbons and place into large mixing bowl. Shred beets using the grating blade on a food processor (easiest) or using a cheese grater (good luck!). Add to cabbage in large mixing bowl. Once kraut mixture has been well coated with salt and caraway, use your gloved hands to stuff it, bit by bit, into your mason jars. Add a small layer of kraut and then use the handle of the wooden spoon to pound the air out of the layer before adding more cabbage to the jar. You want to make the mixture as anaerobic (air-free) as possible to avoid mould and to allow the friendly bacteria to flourish. Continue adding kraut mixture to the jar, layer by layer, pounding out excess air throughout, until there is between 1 and 2 inches of free space left near the mouth of your jar. Roll outside leaves of the cabbage into tight, burrito-style rolls and stuff on top of the shredded kraut mixture. The aim is to pack the jar as tightly as possible, right up to the top with the rolled outer leaves. Slowly add filtered water to the jar, until it levels with the shredded kraut mixture (not all the way up to the top of the jar). Unless your jar is very large (or you didn’t pack enough air out of the mixture), you will need very little water in your jar. A half a cup is a generous amount– I usually use more like 1/4 cup water or less. Slide the lid onto your mason jar and close it to make an airtight seal. Label your jar with the date, and leave it in a dark cupboard to ferment for between 4 days (warmer climates) and 4 weeks (cooler climates). 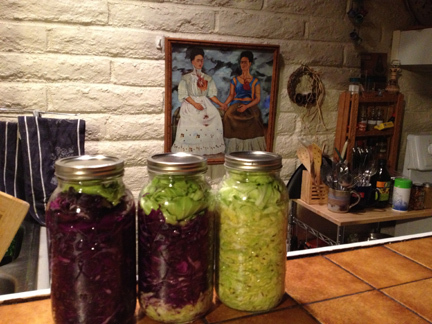 Kraut does best in a room temperature environment, and cooler locales will take longer to ferment. Store opened jars of kraut in the fridge and consume within 2 months. Chopping. Some like it thin, some like it coarse. Packed-in shredded cabbage leaves, waiting for burrito-style outer leaves to finish off the jar. If your kraut develops a black mould or film on the top of the jar while it is fermenting, believe it or not, the rest of the jar should be okay to eat. (The mould will develop where there are still air bubbles.) Simply pick off the mouldy bits and chow down on the kraut further down the jar… using your common sense, of course. 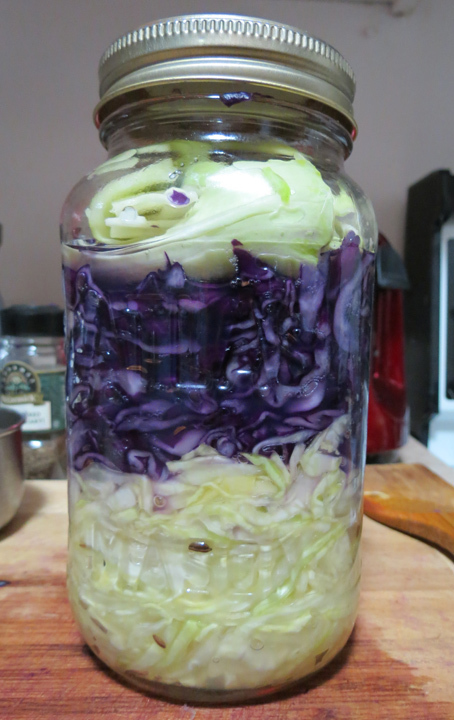 Kraut can sit in a cupboard fermenting for longer than 4 weeks, too. Longer sitting periods make for a tangier kraut in the end. Do not fear the healthy bacteria! 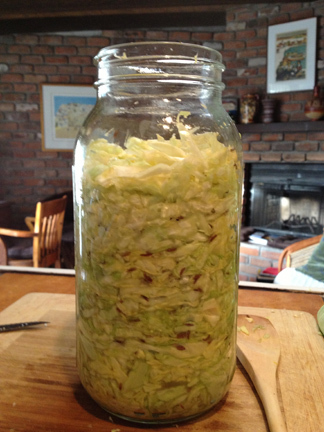 Fermented kraut will taste zesty, a bit salty, and almost like a pickle (i.e. vinegar-y). It is an acquired taste (at least it was for me), but once you get familiar with it, you may find yourself shoveling it back with no restraint whatsoever (at least I did/still do). Use organic ingredients, the highest quality of sea salt you can afford (not iodized or table salt), and filtered/distilled water (not tap water). Table salt and/or tap water can disrupt the naturally occurring enzymes and living cultures inside the cabbage, making your kraut-making adventures a waste of time, ingredients, energy, and money. Use caraway seeds or not. 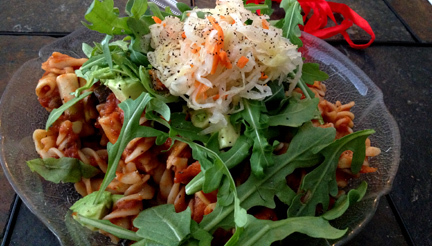 Try adding dill, fennel seeds, dried sea weeds, shredded ginger root, etc. Make the kraut yours! Sub shredded carrots or golden beets for the red beets, or just go with a simple cabbage mixture. 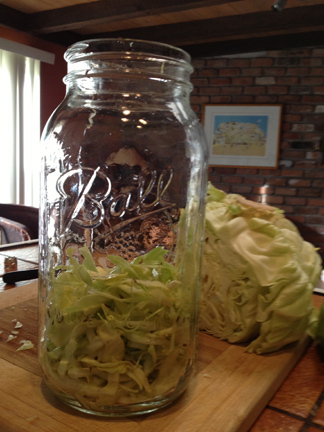 Some people use special sauerkraut crocks, but all you really need is a glass jar with a tight-fitting lid.